Instagram is much more than just that app your daughter uses to post artsy pictures of her dinner. It can actually be a super powerful tool for your business! And with 600 million users and counting, the opportunity to get in front of its audience can’t be ignored. 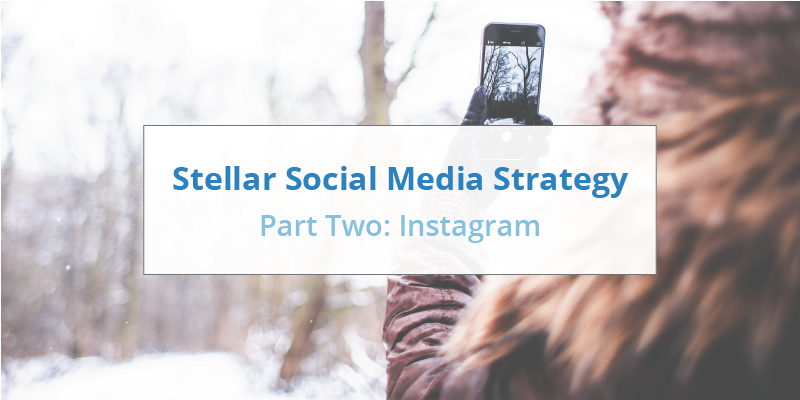 That’s why we picked it as the second featured social media platform in our Stellar Social Media blog series! Miss part one about Facebook? Check it out here. Account name: Your account name will typically be your brand name. If that’s unavailable, play around with adding additional keywords like “rentals” or “vacations”. Remember, this account name will appear above all your photos, so make sure it’s quickly recognizable, professional, and easy to understand. Profile photo: This photo will display in a tiny circle (only about 150 pixels) next to your account name on all your posts. Use your logo if it fits, or consider using another graphic that represents your brand. Bio: In your bio section, be sure to add your website and a quick blurb about your company that’s both engaging and informative. Remember, Instagram is pretty informal, so this is a great place to show your brand’s personality! Connect other social accounts: Instagram allows you to connect your other social media accounts, like Facebook and Twitter. If you already have those channels set up, go ahead and link them up. This doesn’t mean all of your Instagram photos will automatically post to those accounts, but it gives you the opportunity to quickly post on multiple platforms and take advantage of the cross-promotion on a post-by-post basis when it makes sense. Instagram is a bit of a different beast than other social media platforms in that it relies almost completely on visual content and there are no clickable links in posts. However, armed with a good cell phone camera, a bit of creativity, and the knowledge you’ll gain from this blog post, you’ll be on your way to becoming an Instagram master. Post eye-catching photos. Dive into the library of photos from your website, blog, or Facebook page, or snap a new one right from the Instagram app. Choose photos that are high-quality, have interesting content, and stand out against the millions of photos posted each month. Become a resource for your area. Travelers are increasingly using Instagram as a resource for vacation planning. While posting property photos or videos is a great way to share the story of your company, consider broadening your content to also include tips about traveling in your town or features of your favorite landmarks. Utilize your blog. If you have existing blog posts that guests love, consider taking a quote or image from those posts and repurposing them for your Instagram audience. Put a face to the brand. Guests love getting to know who they’re renting from. Share behind-the-scenes photos of your team, photos of your family travels... anything that gives an inside look at the people behind your brand. Highlight your properties. Give your followers a taste of your inventory by sharing property photos. The best part? You probably already have a great bank of property photos to choose from! When deciding which photos to feature, consider what your target audience would like to see. For example, if you’re hoping to appeal to families, feature kid-friendly amenities like bunk beds and a pool. Or, target couples by featuring a cozy fireplace. Post fun quotes. Use an online tool like Canva to turn funny, relevant quotes (or even guest reviews) into beautiful, shareable graphics. Test out videos. Instagram videos are super easy to produce – just shoot them right there within the app! When your followers come across a video in their feed, it automatically starts playing, likely capturing their attention more than a standard photo. This is a great way to highlight properties, employees, cool events in the area, and whatever else your imagination can dream up! Build connections by reposting other people’s content. Explore Instagram accounts that feature unique posts about your town and consider reaching out to them to see if you can share their photos on your feed. Not only does this help you build connections with users in your area, but also adds to the variety of your posts. And who knows, they may be willing to share one of your photos in return! You could also consider reaching out to past guests to see if you can share photos they took during their stay; just be sure to tag them in your post. Currently, there’s no way to re-post other users’ photos within the app, but third-party tools like Regram can help you make it happen. Experiment with filters. Instagram filters can take your phone camera photos and turn them into professional-looking pieces of art! If you find one you love, consider making it your signature filter and using it on any photos that makes sense. Unlike other social media channels, the only way to search for posts on Instagram is by using hashtags. (For example, I’d have to search for #laketahoe rather than “Lake Tahoe”.) So, to get your posts in front of more users, you’ll definitely want to start using hashtags. The trick is to use the right ones! Unfortunately, it won’t do you much good to make up your own. Your best bet is to use hashtags that are already popular, helping you get the best visibility on your posts. A tool like Websta can help you discover top trending hashtags in your category. It’s not unusual to have as many as ten hashtags in an Instagram post. In fact, it’s been shown that there is a positive correlation between the number of hashtags you use and the number of likes you receive. Testing out a variety of hashtags to see which ones help your posts perform better will build you an arsenal of hashtags to strategically use in future posts. In addition to using the right hashtags, there are a few other strategies you can use to increase your Instagram following. Target your competitor’s followers. These users are likely already interested in vacation rentals in your area, so they’ll be a great audience to get in front of. At the top of your competitors’ Instagram profiles, click the “# followers” link to see who is following their account. From there, you can choose to follow anyone on that list. When you follow them, they’ll receive a notification from you and can follow you back. And with all that great content on your page…who wouldn’t? Increase the chances of them following you back by liking or commenting on their photos. Connect with influencers in your area. Use hashtags to search for Instagram users in your area that have a lot of followers. Instagram is unique in that it’s not always the big name companies that have the biggest accounts. While your local tourism group may be a great account to connect with, there may also be a local person who posts about the town and has a strong following. It’s fun to dig around and see who you can find! Share your Instagram photos on other channels. Instagram makes it easy to share any of your posts to your other connected social media channels. When your Instagram photos pop up on your other social channels, not only does it allow users to like and comment on the posts, but it also alerts them to the fact that you have an Instagram account that they may want to follow. Add a link to Instagram on your website. You likely already have links to your other social media accounts on your website, so be sure to add your Instagram account! Tag your location. Any time you post on Instagram, you can add a location. Before people travel to your destination, they may search Instagram for cool pictures of that area to help them plan. If you add your city or neighborhood, people are more likely to see your photos when they’re searching for that area. The newest Instagram feature, Instagram Stories allows you to post a collection of photos and videos that tell a story in real time. They don’t appear in your regular collection of photos, but instead show at the top of your followers feeds and play in succession. After 24 hours, anything you’ve posted to your story disappears. Consider using this feature to highlight local events, current rental specials, events around your office, or other timely happenings. Once you’ve snapped your photo or video, use Instagram’s editing tools to add text, tag other users, or swipe to add filters. You can also swipe right within the Stories feature to post a live video. Your followers will get an alert and can watch your video in real time. Outside of posting awesome content that your followers can find organically, Instagram’s advertising platform offers a paid way to get in front of a targeted audience. They are also the only posts on Instagram that allow for a call-to-action button, so people can be taken directly from your ad to your website – all within the Instagram platform. There are two different ways you can pay to get in front of users. Either create an ad from scratch within Facebook’s Business Manager (Facebook owns Instagram so they share some functionality) or promote an existing post right from your Instagram app. You’ll first need to set up a Business Manager account within Facebook. You can then add your Instagram account by going to “Business Manager Settings” and clicking the Instagram icon from the left-hand menu. Next, you’ll select your audience by choosing from a variety of targeting options. And then you’ll select your budget and set the ad schedule in the “Budget and Schedule” section. This awesome video from Hootsuite will guide you in selecting your target audience. Once you have all your ad parameters set, upload the image(s) you’d like to use and set your caption. We recommend an image size of 1080 x 1080 pixels and a caption of no more than 125 characters. Be sure to fill in all the ad details – including headline, text, call to action and any advanced features you’re taking advantage of. Next, make sure that your placement selections are set up the way you’d like. If this is just an Instagram ad campaign, you’ll want to make sure the other placements have been removed. Once the ad looks the way you want it to (and you’ve triple-checked it! ), place the order to send your ad out into the Instagram universe! Your ad results display in your Ads Manager. This helpful FAQ will help you understand those results and make any necessary adjustments to your campaign. If you have a photo or video that’s performing really well, you can easily turn it into a promoted post right within the app. From your profile, select the Insights graph icon at the top of the page. Scroll to the bottom and tap “Create a new promotion”. Choose the photo or video you want to promote, and then follow the prompts on the next screen to set up your promotion. You can choose your call to action, create a custom targeted audience based on demographic, and set your budget and ad schedule. It’s as easy as that! Keep track of your promotion’s success in your Insights. Instagram Insights gives you an inside look into your followers’ demographics and behaviors and provides information on which of your posts have performed best – information that you can use to help you craft more targeted content. Top posts: Take a look at your top posts to see what your followers most respond to. By tapping just above the posts, you can filter the results to see even more data. Keep an eye on this section to help guide your strategy. If your followers prefer video over photo, consider mixing in more video content. If they tend to engage more with fun behind-the-scenes photos of your team, you can look at posting more often about your company culture. Followers: Click “See More” in the Followers section to open a page chock-full of data about your followers. Then, as you craft your posts, keep in mind your followers’ gender, age, and location information to help you better target that group. When it comes time to share that content, take a look at the last graph to figure out which days and hours your followers are most often on Instagram and use that to determine the best time to share that content. So, what are you waiting for? Get ‘gramming! Experiment with some of the strategies above, find your niche and build your following. Stay tuned for the next installment in our Stellar Social Media Strategy series: the massive world of Twitter. What did you think? Did we miss an important tip? Have you had success using Facebook to market your business? Let us know in the comments below.